Construction is complete and includes over 14,000 sq. ft. of Travel Center space, an eight MPD auto canopy and a five lane master/satellite diesel fueling canopy. It will also include a food court w/ restaurants including Dairy Queen, Wendy’s and Subway. It will be a hotspot for road warriors, with it’s complete trucker amenities such as showers, laundry, a truckers lounge and a game room. The travel store will provide an array of items for travelers. 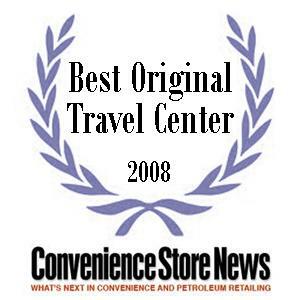 Award Winner: FastTrack awarded 2008 “Best Original Travel Center” by Convenience Store News.